Little boys can be hard to buy for. For valentines day every where you look there are pink hearts, cute teddy bears, flowers, candy, etc. With the exception of the candy possibility, typically these are not things that are on the top of the list for most little guy. If you are looking for a last minute gift for Valentines Day, consider this brand new release from Phase 4 films....The Jungle Book! This classic story brought to life in this animated feature. This is appropriate for boys or girls. Join Mowgli and friends for a night of adventure, as the lush and energetic jungle comes alive with the DVD release of The Jungle Book: Rumble in the Jungle. The action packed feature length movie will be available exclusively at Walmart stores in the U.S. and features a downloadable activity kit, slide show and exclusive, collectible Mowgli and Baloo figurines for continuing The Jungle Book fun after the DVD player is off. Not only is this great for a valentine's gift - it can be a great purchase for your next Family Night Feature. My daughter got so excited when she saw the packaging that she opened in up immediately and took it upstairs to our loft area. The toys are super cute and appealing to kids 3 and older (the figurines are small and should not be given to toddlers as these may present a choking risk). The girls seemed to like the film (Miss E and her best friend). I plan to watch this weekend with them. I will come back with more information and then. I did walk by during their viewing and Phase 4 hey really took it up a notch with the animation for this film. The graphics are very crisp, colorful and modern. It is also suitable for viewing for the entire family. Thanks to SheSpeaks, I was recently able to review new the L'Oréal Paris Magic BB Cream. I am so glad I did - This cream is incredible! I was really not expecting anything one way or the other but was very surprised at how much I loved this cream. In the mornings I cleanse, treat, moisturize, and prime before applying makeup. With this cream, after I treat (retinol) I can eliminate one step and only use the Paric Magic BB Cream. 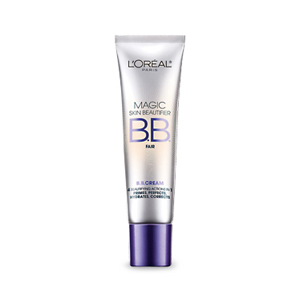 L'Oréal Paris Magic BB Cream retails for $10.95 for 1 fl oz. It is available in four shades and is sold at mass food and drug retailers nationwide. Click here to find out more. I find that this moisturizes and primes in one step, giving my skin a smoother surface before applying makeup. It sets immediately so I can even use powder mineral makeup without waiting for it to dry. With other moisturizers I usually have to wait a few minutes because applying powder makeup over a moist skin surface causes uneven application. Since I am usually in a rush this is a HUGE plus for me. I would definitely purchase this again. I have enlarged pores so I regularly use a primer - I love that with this product I do not have to purchase a separate moisturizer. I still prefer to use base but if I wanted to run out of the house for some quick errands, this could do the trick without having to do a full make up job. If you are in the market for a new facial moisturizer and/or primer, make sure to check this out! Disclosure - I received a product for review purposes. I did not receive any monetary compensation and all opinions expressed are my own. One lucky winner can choose from four awesome choices - each basket is loaded with premium chocolate from some of the best chocolatiers. Yum!!!! I know very few people that do not like chocolate but countless others that LOVE it. I happen to be a super fan of chocolate. These baskets are great for any occasion - birthday, get well, congratulations, holidays, etc. The Godiva name is known for excellent quality. If you want a gift with great presentation and taste, look no further. 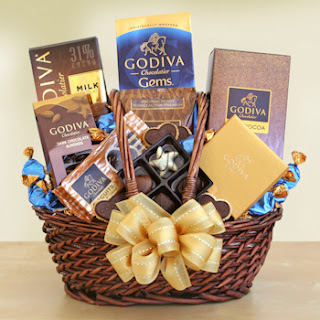 This wonderful basket is filled is generously filled with an extensive variety of Godiva. 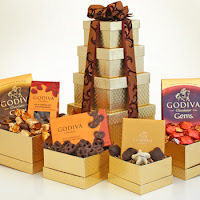 The gift includes a classic 4 piece gold box of assorted chocolates, chocolate biscuits in heart shapes, almonds covered in irresistible fine dark Godiva chocolate, 31% cacao milk chocolate bar, and Godiva gems. And if all that edible goodness wasn't quite enough for you, we've also included some delightful drinks like Godiva premium roast coffee, along with delicious milk chocolate and dark chocolate cocoa. If you like variety this is the basket for you! 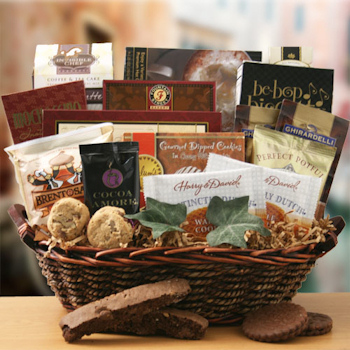 This is filled with all kinds of chocolate goodies including Amore hot cocoa, a mocha latte tea cake mix, chocolate biscotti, triple fudge brownies, Italian chocolate raspberry cake, chocolate chip cookies, chocolate dipped cookies, chocolate covered wafer cookies, and Ghirardelli hot cocoa. 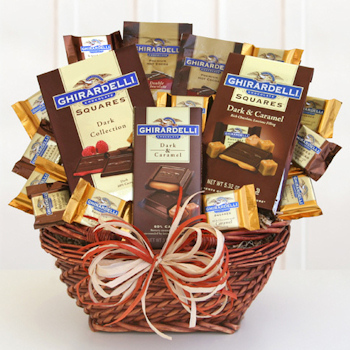 This rich, decadent sampler is all about Ghirardelli - another premier brand synonymous with quality. Every time I hear the name I think of Ghiaradelli Square in San Francisco. Ghirardelli has a fascinating history and one of the most stringent production processes in the US for chocolate making. This beautiful sampler is filled with the Ghirardelli's best dark chocolate selections including dark chocolate and caramel presented as both squares and a bar, dark chocolate hot cocoa mix and dark chocolate cacao squares. Any of the options are acceptable, and entries per person are limited to the number indicated in the contest form. Entries will be reviewed and duplicate or uncompleted entries will be removed. 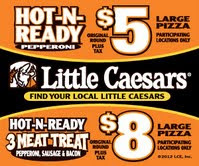 NOTE - You must complete the specified entry task in order to be eligible to win the contest. If you hit the green entry button without completing the task, your entry will be disqualified. - Winner chosen at random. - The winner will receive their choice of a chocolate basket or gift tower valued at up to $85 from the 4 options shown above. - The winner will be notified via the e-mail. Winner must respond within three days of being contacted. If you do not respond within that period, another winner will be chosen. The full list of rules can be found here . Sweepstakes ends at midnight EST on February 24, 2013. The sweepstakes winners will be announced by March 1, 2013. Disclosure: I did not receive any form of compensation for this post. Sponsor is responsible for prize fulfilment.